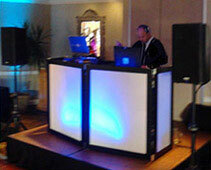 "Izzy did a great job at my daughter's Bat Mitzvahs. He interacted with all the kids and adults and made the evening memorable. 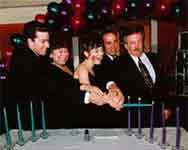 :)"
Bar/Bat Mitzvahs interactive high energy DJ/MCs? 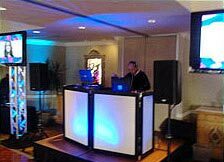 Featuring Ft. Lauderdale Florida High energy "Interactive" Mitzvahs DJ/MCs, Disc jockey entertainment, Party Motivators, interactive Dancers, Up lighting, Photography, Videography, and much more. * How can I have a party that engages and entertains both the adults AND kids? * My daughter will have attended several Bar and Bat Mitzvahs by the time hers comes around. How can I make hers unique? * How can my event be fun but also classy and elegant? * Is it possible to find a good interactive MC that doesn't get overbearing and on peoples nerves. * Does the DJ have to even be interactive? 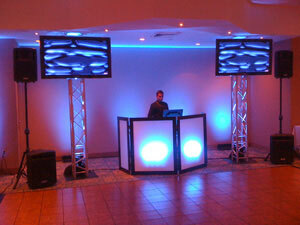 or can you just have a night club feel to your event, or a little of both? The answer to all these questions is yes. Our Mitzvahs Interactive MC / DJ and Mitzvahs party motivators have the right personality and experience to ensure that your Mitzvah will be uniquely customized to you and your specific needs, they will Engage with the audience and create a show like no other, for over 28 years we have been doing just that, "Your day your way" is our model, please contact us right now for an appointment to meet with one of our Bar/Bat Mitzvah interactive DJ/MC's, Entertainers, or Party Motivators that can answer all of your questions..
Why do you need a DJ that specializes in Bar Mitzvahs? 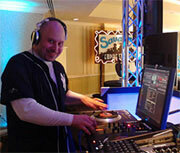 Not Just any DJ can DJ a Bar/Bat Mitzvah, because Bar/Bat Mitzvahs usually have a mix of adults and kids all in the same room, and their musical tastes differ quite a bit, and entertaining both kids and adults at the same time while in the same room is what Bar Mitzvah DJs specialize in. Have You ever seen those Bar/Bat Mitzvahs where its just kids on the dance floor and the adults are bored all night, or some Bar Mitzvahs the adults might be enjoying themselves but then the Kids are upset and complaining? 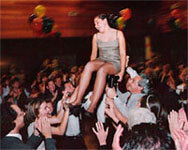 Well that’s because some DJ’s specialize in entertaining an adult crowd such as wedding Receptions, and some specialize in young crowds at middle schools, or Hot mix dance parties, etc., but a Bar Mitzvah specialist knows how to mix it up just right so everyone has a blast, they are also experienced in music that pleases all ages, and this is what keeps that dance floor packed all night with all age groups participating in the fun. We let you choose and design your own party and we stick to your agenda. Months before the party we will be working with You asking the right questions so as to customize everything exactly the way you want it. You have many choices to choose from. * Hoola hoop contest, Musical chairs, Limbo, Mummy rap, Karaoke sing along game, snowball dance, scavenger hunt musical chairs, freeze dance, coke & Pepsi, Balloon relay race, etc. 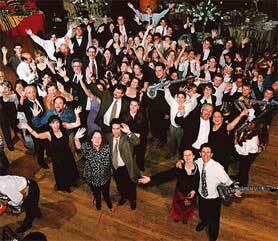 * Interactive dancers to spice up the dance floor: (Electric Slide, Cha cha slide, Conga line, soul train, YMCA, Dollar Wine, Mississippi slide, Cupid shuffle, etc). 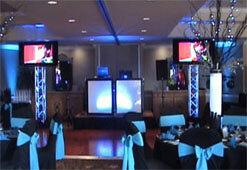 * "Hot mix” dance party’s with Laser light shows, to create more of a “Night Club feel” to the night. 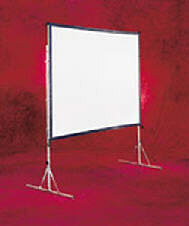 * Music Video “Hot mixing” with large screen LCD’s up in the air, this is the premium package. * Karaoke: We offer a large collection of karaoke, with all the memorable oldies as well as all the latest new music the kids love. *Props Package with Glow necklaces, Glow sticks, Hats, whistles, blow up Musical instruments, maracas, tambourines, etc. * Or maybe "all the above" mixed together just right, if you really want to go all the way with it. If you got the budget and can dream it up we can make it happen with style. Our interactive MC’s can also teach your guests the latest interactive dances as well, and keep the dancers motivated on the dance floor all night with sets of hot mixed music to create ”the party everyone will be talking about. 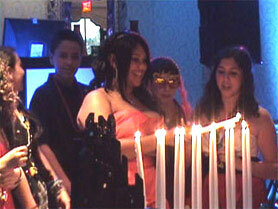 Click here to see a BatMitzvah promo video, Click here to see a BarMitzvah promo video.